While passing by a fish counter at our local Metro supermarket I spotted my favorite fish counter server removing mussels from just received box and placing them in display case. Well, another meal idea was born even though the reason I went shopping in first place was to get my veal chops that I had a rain check for. Mussels can’t wait but veal surely can. These were fresh as well so one day will not hurt. Braised veal chops in mushroom sauce will be my post for tomorrow. Anyway, today’s recipe is basically Linguine con le Vongole but instead of clams I’m using fresh mussels and since I made big batch of fresh pasta two days ago I served it with fresh linguine. And what a treat it was! Clean and scrub the mussels, and discard any open ones. In a large stockpot heat the olive oil over low heat, add the garlic and sauté until just fragrant. 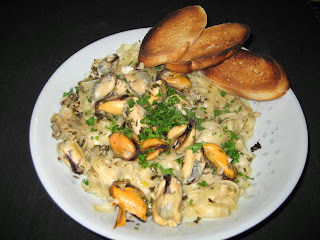 Turn up the heat to medium-high and add the mussels. Cover the pan and steam the mussels until they open, about 3-5 minutes. Occasionally shake the pan to help them cook. Check the mussels. Those that didn't open, take a small paring knife and try to help them open. If they open and smell good, then you can use them. The stubborn and/or the bad smelling ones, discard. Turn down heat to medium-low and remove the lid. Pour the wine over the mussels and deglaze. 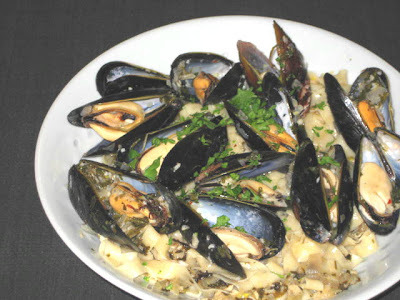 Remove the mussels to a side dish, cover to stay warm. Add the herbs and reduce the wine by 1/3. When reduced, stir in the parsley and remove form the heat. 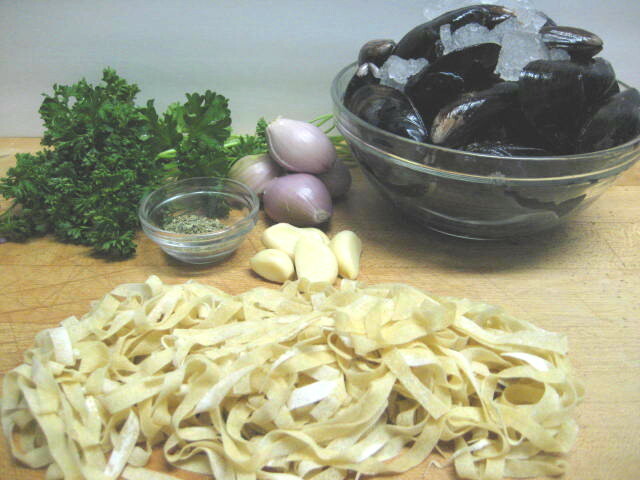 Meanwhile, cook linguine in a large stockpot or pasta pot of boiling salted water. When the pasta is al dente, drain the pasta, then toss the pasta with the sauce. Divide the pasta between individual dinner plates. Arrange the mussels attractively around each plate and serve with a little additional fresh parsley on top for garnish. Definitely more friendly way to serve this meal. Not as photogenic but so much easier to eat!